Hours before the annual Dakota Days game Saturday, Ben Klett learned he would step in for an injured Kai Henry at the starting running back role. Sixty minutes of play later, Klett would walk into the depths of the DakotaDome with his first three touchdowns of the season in a 35-28 victory over No. 24 Missouri State. Carrying the ball only 25 times this season prior to Saturday, Klett said he needed to elevate his performance during his first start. Klett’s part being 98 yards rushing and a triad of touchdowns, a USD ground game ranked last in the Missouri Valley Football Conference finally found stability in the backfield, something head coach Bob Nielson said he’d been searching for. Aiding Klett in the backfield was sophomore Brandon Thull, who ended his first game appearance with 40 yards on nine rushes, most notable of those rushes being an 18-yard gain where Thull drove a MOSU defender into the ground with his left shoulder. Nielson said the success on the ground opened up the passing game, led by junior quarterback Austin Simmons, who threw for 337 yards and a touchdown on 28/38 passing. One of those deep connections was a 40-yard touchdown pass to sophomore Levi Falck with 13 minutes left in the game that put the Coyotes up 35-28. The score gave USD the lead, but a defensive lockdown for the rest of the quarter secured the win. An MOSU offense conducted by junior quarterback Peyton Huslig, who leads all MVFC quarterbacks in rushing, was shut down on their final two drives. The closest threat came with 2:22 left in the game, when, on 4th down & goal at USD’s one-yard-line, senior linebacker Alex Coker made an open field tackle on a pitch to MOSU running back Donovan Daniels. With 55 seconds, left the Bears again attempted to drive down the field but passes broken up by sophomore cornerback Mark Collins Jr. and senior safety Andrew Gray sent the Bears home with their second loss of the season. Gray was accountable for two forced fumbles and an interception, adding ten tackles as well, and though the defense gave up 478 yards on paper, Coker said they stood when it mattered. USD moves to 3-2 on the season and begins conference play 2-0, an ideal start to a year in the MVFC Nielson said will be “interesting”. Nielson said that an audience of just over 10,000 at the homecoming game smothered some of Missouri State’s momentum. Next Saturday, the Coyotes host a Northern Iowa team that led No. 1 North Dakota State for three quarters on before falling in 56-31 while the USD was battling MOSU. 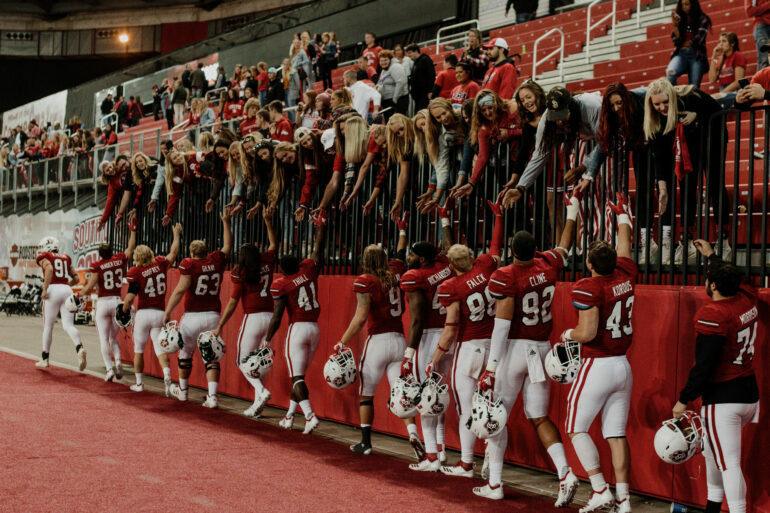 For now, Nielson hopes the Coyote faithful can enjoy what they saw on Saturday.